Yes, these are for real! 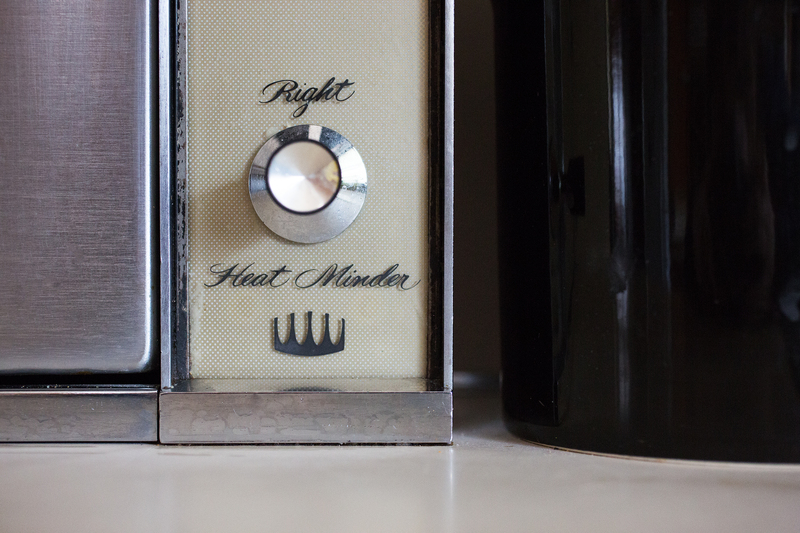 Admittedly, when we first toured our house – we thought the range was cool but couldn’t imagine actually using it. Renovation ideas danced in our heads. But it slowly became one of the first things guests asked about when they visited and we realized how genius these fold-down ranges actually are. They heat up super quickly and are sleek, space-saving & mess-hiding (in a pinch). I’m not promising that we will never renovate, but since they are in working condition we plan to keep them around for a while! 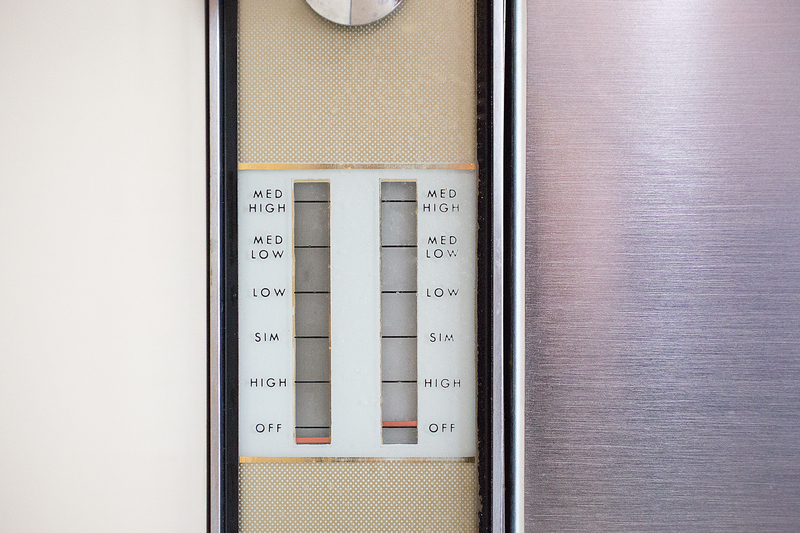 A bit of history – these ranges were featured and won a design award in the World Fair between 1955-57. 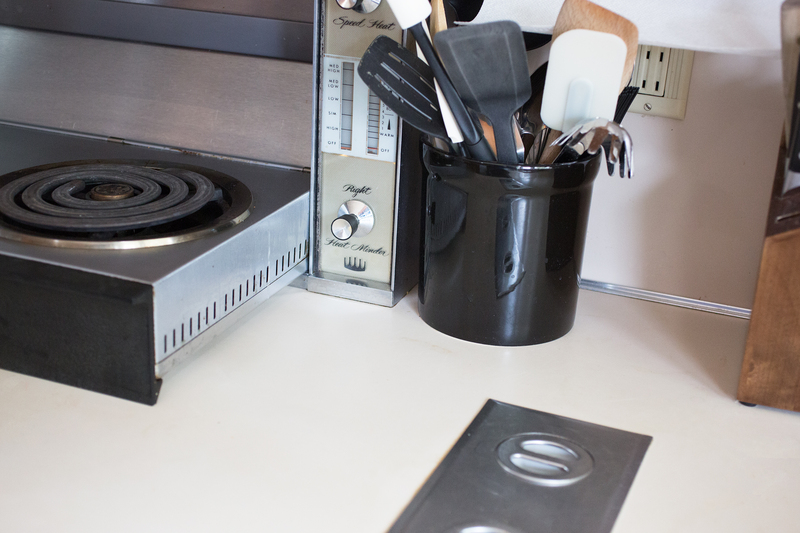 Originally called Fold Down Electric Surface Units, each unit came with one 6″ burner and one 8″ burner. They were marketed for island and galley kitchens due to their space-saving design and were sold for $192 per unit until the early 1960’s. These fold-down burners were quite the novelty item. They were sold in closeout liquidation sales in 1963, so despite their unique design they obviously did not stand the test of time. The fold-down range’s counterpart, the built-in wall oven (often marketed and sold as a package deal) has stood the test of time and is very popular in today’s kitchens. I am no expert, but ours is in quite good condition for being over 55 years old and being used almost daily. Most of the chrome and stainless steel surfaces still shine like new! The black collects dust so it gets wiped down frequently. The knobs are intact, original and in working condition. The stainless steel has obviously been scrubbed more than once. The wording is intact, though the gold and black paint is starting to wear off (you can see this in the third & fourth photo). On the inside there is some burnt on plastic that I have not tried to remove yet. Now that we have decided a kitchen renovation is several years away, I will be giving this unit a good detailing. I usually just use a wet dish cloth to do a quick clean every day but I should probably start using some stainless steel cleaner and a soft cloth to give it the TLC it deserves! 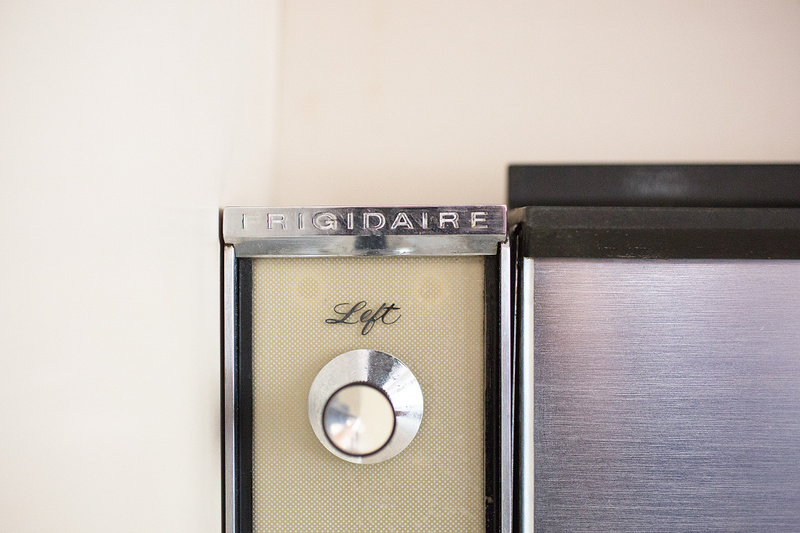 We have a 1950’s Frigidaire fold down cook top and we are interested in selling it as we are moving and will have limited space. We also have a Nautilus hood type fan that goes with it. It all works very well. I would be very interested in purchasing your fold down cooktop. It is a two sided double burner set in good working order I hope? I need to replace one on my parents house in NC. I would be very interested in purchasing a fold down cooktop. I need to replace one on my parents house in NC. I hope that you can find what you are looking for! There are a few people on here that were selling their units, if you want to get in contact with one in particular let me know and I can put you in touch with them. Do you still have the fold down cook top? If so how much do you wish to sell it for? Hey Edgar! Our fold-down cook top is still in working condition and we use it daily! 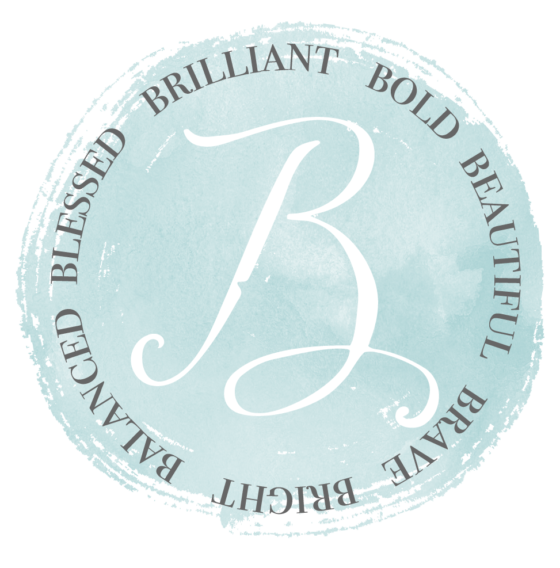 Not for sale at this time but if we ever decide to remodel our kitchen then I’ll definitely be referring back to those that are interested here on the blog! Definitely take a look at Ebay or Craigslist! There are also several people on this post selling theirs. Best of luck finding what you need! I am interested in purchasing another frigidaire rbw84 foldback unit. I have pictures. 2 sets of 2 burners. Each set of 2 folds down as a set. Hello! We use ours daily, not for sale at this time but they are handy little units aren’t they!? Mine is currently not for sale, if you check the comments it looks like Steve has a set for sale! Best of luck finding what you need, it is a neat setup isn’t it? Hello! My 60’s fold down units are not working very well and I have been looking for replacement units. Are yours stil for sale? Hello Linda! Our units are not for sale, but I can definitely see why you are looking for replacements – we love ours! Best of luck finding one! I’m just curious if you’ve ever tried having someone come work on it? I just ask because I anticipate that ours won’t work forever and I wonder if they are possible to repair? Steve – were you able to sell yours? There are some people here in the comments curious about value. If so, where did you end up selling them? I have two of these fold down units that were in my house. They were still working when we bought it last year. I have no clue as to how much these are worth? Do you know? Love the post. That’s so fun! We are still using ours so I haven’t had a chance to check the market to see how much they are selling for. We have a local Mid-Century Modern Buy/Sell/Trade group on Facebook, that’s where I plan to start asking when the time comes! There are also several people in our neighborhood who have kept their homes original, I might start asking around to see if anyone needs replacement units or parts. 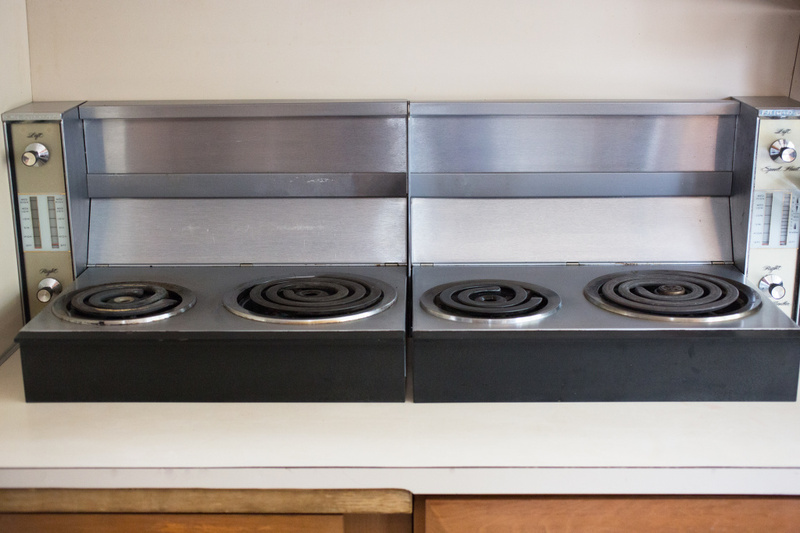 The house I grew up in had these fold-down stoves and my mother was disappointed she couldn’t find the same ones when they sold the house in the 90’s and moved to a new house. 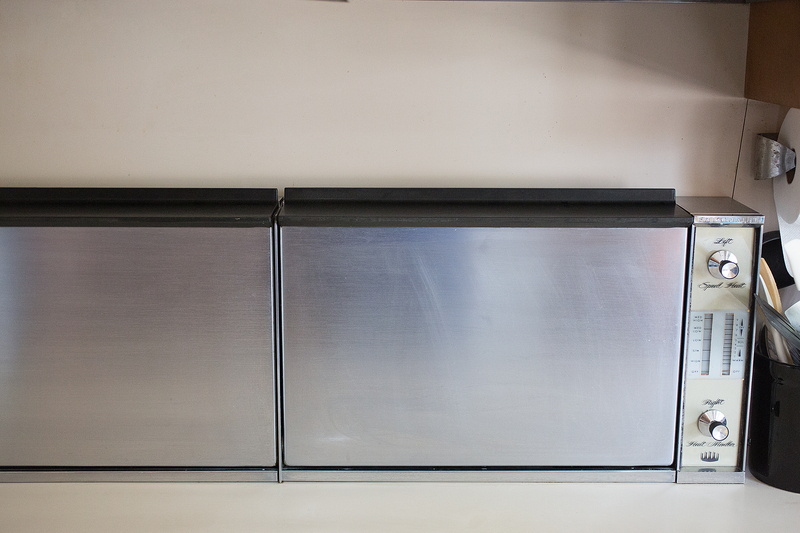 They were simple to clean and they freed up a huge amount of counter space for food prep. 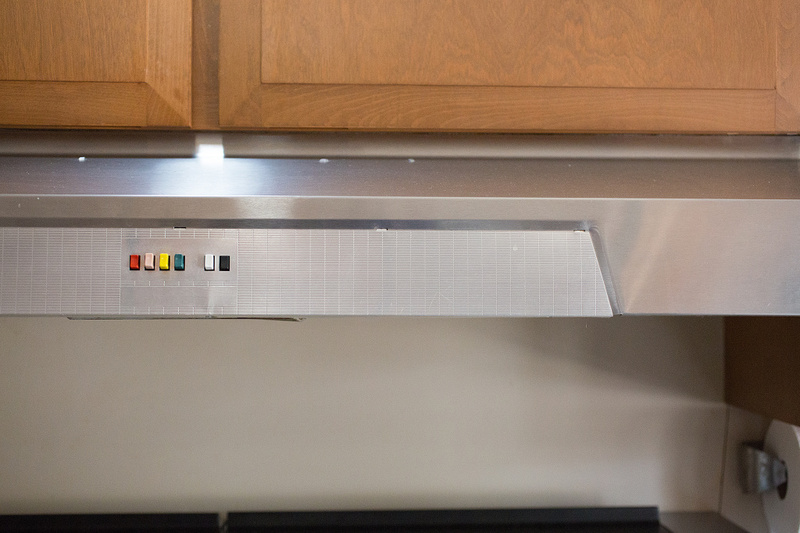 I don’t know why some manufacturer doesn’t consider making these fold-down stovetops again, especially if there was some way to make one that uses gas rather than electricity. I love this! 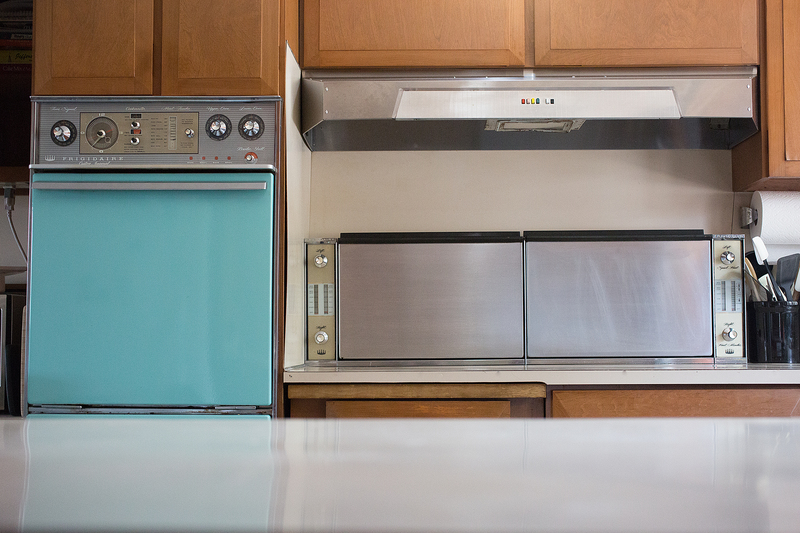 Thank you so much for sharing about the oven and stovetop in your childhood home. I completely agree, they are so simple and such a neat design. Nothing better than clearing off the counter and hiding them away. Your oven sounds very unique, I have never seen anything like that – I’m going to research it! I saw one on E-bay for $400. It looked pretty used however. If anyone has one for sale I am definitely interested in purchasing it to replace one that’s no longer working.